Jessi is a local chalk artist and is president and co-founder of the GA chalk artists guild. She travels with her husband (and now baby) to chalk festivals all over the world including Italy and Germany. She is a new mom and plans to continue chalking all over and bringing her baby with her. 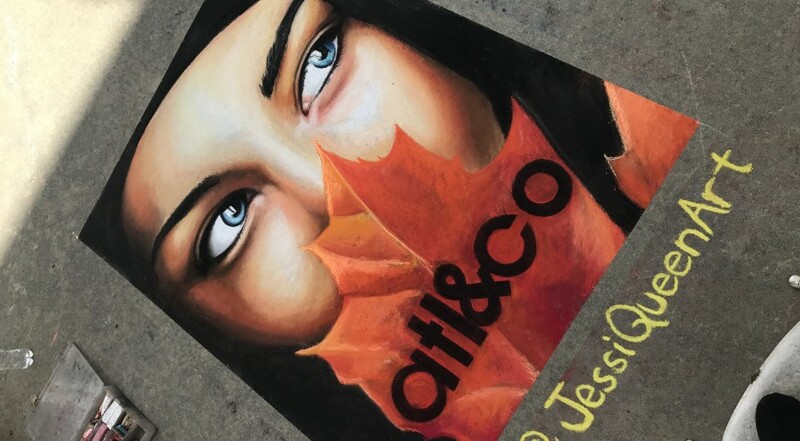 Jessi – how long have you been a chalk artist? How’d you get into it? I went to Savannah College of Art and Design and am from Savannah. I started with the SCAD festival there and have been creating chalk drawings ever since. Do you only create your work using chalk? How do you preserve it? I work as a UX designer full time and travel to events all around to do chalk murals. Last summer we went to Italy and Germany for festivals. I also paint murals and participate in local art shows with mostly chalk pastel drawings. I do not preserve the chalk art on the ground. It is meant to be ephemeral and is more about the process than the finished piece. What will you be creating at this year’s festival? What’s the theme this year? I am chalking a portrait with some geometric shapes. I photoshop images to get a composition I want and then chalk it. The theme is “Bring your A game” I specialize in portraits and there are many talented people from all over the world drawing what they draw best. We will also have a tent for the GA chalk artists Guild this year so come by and learn more.